Ja Morant had an absurd season. He averaged around 24 points, 6 boards and 10 assists a game. But it wasn’t just those raw numbers. Per Kenpom stats, he played 94 percent of his team’s minutes. He took 29 percent of his team’s shots. Yet despite that high usage rate, he didn’t take a lot of bad shots. As a team, Murray State ranked fourth in the JumpShotQ stat, which measures shot quality. But Morant’s season is over. 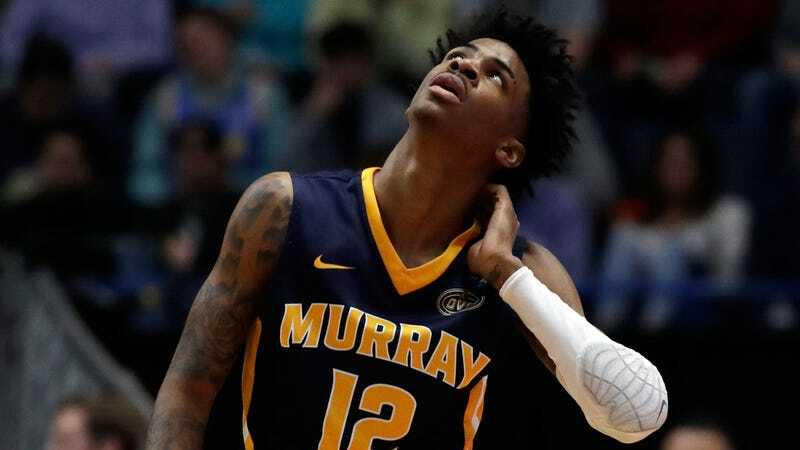 After his triple-double lead the 12th-seeded Racers to a win over Marquette, Morant looked poised to do it again. Murray State was a trendy upset pick in the second round. And, early on, it looked like he really might. Playing against fourth-seeded Florida State, Morant hit a three on his first shot. The next possession, he hit Shaq Buchanan for a layup. A bit later, he hit two three pointers to give the Racers a 13-7 lead. People were ready to believe again. That didn’t last. Florida State simply pummeled the Racers inside. When they missed, they got offensive rebounds. Florida State shot 50 percent from the field. On the other end, Morant got his points but couldn’t get anyone else on Murray State involved. He finished with 28 points, but just four assists. Florida State won, 90-62. They will be a tough matchup for whoever wins Gonzaga/Baylor. But it won’t be the last you see of Ja Morant. He’s projected to go in the top-5 of the NBA draft. Ja will continue to rule in the NBA.